Transcript of Dr. Carr’s How Do Treatments for IBS Work? Good afternoon, everybody, I am Martin Carr, MD a gastroenterologist here in Orange County, CA, for the past 30 years. This is the first week of January, a rainy day here. We are going to be discussing the topic how do treatments for IBS work. Before I get to that I want to put in a comment here about the social media platform Twitter that has really been a fabulous addition to my exposure to the world in the past few years. I would encourage any listening who has never downloaded the Twitter app onto your phone or tablet to do that soon try to find some interesting people in your area of expertise or people who are experts in some hobby of yours or people involved in politics or education and start following some of them once you are on Twitter. I think you will find it quite amazing what you can be exposed to. So to our topic today– how do IBS treatments work. We will be covering how different types of fiber can be a treatment for IBS, how probiotics can be a treatment, and how different herbs, medications and finally mindfulness based stress reduction can be treatments for IBS symptoms. But first I want to summarize what the digestive tract does after you start to look at a piece of food and get ready to eat it. The first thing that engages is your brain. The brain sees the food, smells it, tastes the food and your brain stays involved every step of the way. Not only is it controlling it, but it is also being affected by what is happening in digestion and even being affected by what the bacteria are doing later on in the process down in your intestinal tract. Let’s start at the top. You are sitting eating something good and if you are a vegan you could pretend that it is a bite of a black bean veggie burger on a gluten-free roll with vegan mayonnaise or if you are a meat eater, it could be a bite of an In-N-Out burger. Either way, you chew it, taste it, and saliva is produced in response to the chewing and taste of the food. Saliva contains one of the first enzymes to start interacting with the food, that’s the enzyme amylase which starts to break down some of the carbohydrates and sugars. So the food then goes into your esophagus, which carefully gets the food down into your stomach. It is not an accident–the esophagus works very, very specially to do that. In the stomach there are sensors for fat, protein, carbohydrate and as your stomach fills with food it produces acid up at the top of the stomach. That acid will actually trigger the release of some gut hormones that tell the pancreas to secrete enzymes including amylase, which the salivary glands also produce, that starts breaking down the carbohydrates. Lipase is produced by the pancreas–that is the fat digesting enzyme. The pancreas also is involved in some of the protein digestive enzymes and acid from the stomach has to activate some of them. Meanwhile, the gallbladder is getting a signal from the stomach through another gut hormones and the vagus nerve branches to secrete bile, that greenish liquid that you may have vomited up once if you were ever ill with gastroenteritis. Bile contains a mixture of things that help us to digest fats and also to absorb fats and the breakdown products of fats and the fat soluble vitamins which are vitamins A, D, E and K. So the stomach is slowly turning this food and over anywhere from 1-3 hours depending on the nature of the size of the meal, your stomach is slowly mushing up this food. It does not release anything into the first part of the small intestine until the particles are 1 mm in diameter or 1/25 of an inch. This liquidy mixture starts to drip into the duodenum, the first foot of the upper intestinal tract, the small intestine, and there more hormones are produced and there is feedback to the vagus nerve. That feedback to the vagus nerve up to the up to the brain is already starting to make you feel that you are full from eating. You start to slow down and finish your meal but the intestines keep on working on that. This action of the stomach and the enzymes and the gut hormones and feedback up to the brain to stop eating is followed by digestion of the digestible calories into small units that are then absorbed all in the first 3 feet of the small intestine. In most of us, there is another 12-15 feet left. The small intestine is anywhere from 15-18 feet long in most adults. Where IBS symptoms of bloating, gas, pain, and changes in the nature of bowel movements happens– all of that is determined by how the rest of the small intestine and the large intestine handle the not as easily digestible component of what we eat. There are 13 trillion or more gut bacteria down in the end of the small intestine and colon that are going to work on what can be referred to as the fermentable food chemicals that we do not have enzymes to break down, digest and absorb. 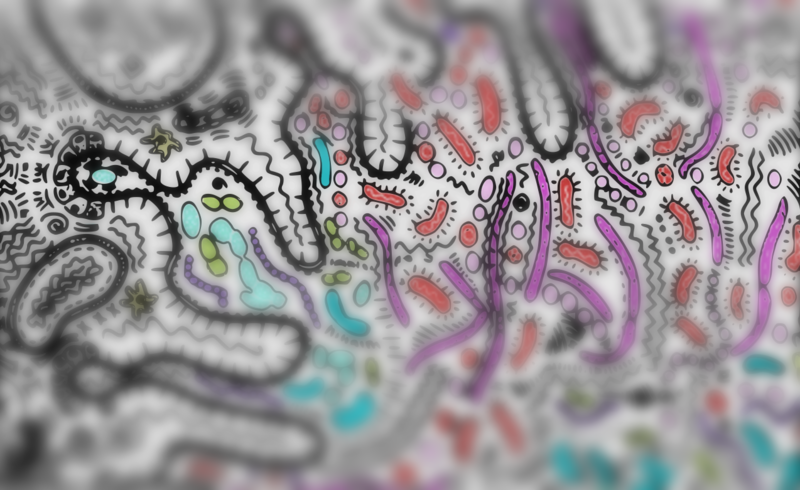 The gut microbiome, which is the phrase for all of the genetic DNA of the bacteria, has way more bacterial genes than we have human genes. Some of those bacterial genes code for enzymes that break down things that we cannot break down, that our human enzymes will not break down, such as components of fiber called names like wheat dextran, oligosaccharides, disaccharides, monosaccharides and sugar alcohols. There are also other important actions of the gut bacteria. They are involved in immune regulation. Bacteria in the gut produce defensins and other small molecules that inhibit what are referred to as the bad bacteria or pathogenic bacteria like certain strains of E. coli that can make us very ill. Our native flora is trying to protect us from that by producing these defensins that inactivate the unwelcome foreign invaders like certain E. coli strains. They also have an effect on the immune cells lining the gut both positive and negative. Bacteria can also produce D-lactic acid and ammonia which can be absorbed and can be toxic to the brain in high quantities. But they also produce hormones and neurotransmitters. Serotonin, which is an important neurotransmitter up in the brain, is also produced down in the gut. That serotonin cannot directly get up to our brain, but it can affect our gut nervous system and then by going back up the vagus nerve to the brain can send signals that can have an effect on even our mood and behavior and our ability to sleep well. Back to the main business down in the small intestinal tract–about 15 years ago, some GI and nutrition researchers at Monash University in Australia studied how typical IBS symptoms, bloating, gas, or, as the Australians like to say, wind, or abdominal pain relate to diet. They developed this concept of FODMAP, which are the letters F as in fermentable, O as in oligosaccharides, D as in disaccharides, M as in monosaccharides and P for polyols, or sugar alcohols. Besides fermenting and creating some gases, bacteria also are manufacturing B vitamins including vitamin B12 and vitamin K which is an important vitamin used by the liver to make certain clotting compounds in our bloodstream. While all of this digestion and gas production is going on, the small intestine and colon are either gently or vigorously contracting and responding to the pressure of gas in the intestines or even responding to the type of gas. For example, methane in large enough amounts in the colon causes constipation by its effect on the enteric or intestinal nervous system, also referred to as the second brain, which controls our intestinal function and links back up to the Vagus nerve that goes back up to the brain. So let’s talk about how our treatments for IBS symptoms like gas, bloating and pain actually work now that we finished the summary of how all of that is working. After you take a bite of food we just followed it all through the intestinal tract being digested. Initially some digestible things are easily absorbed, while some not so easily digestible things are heading down to be handled by the bacteria in the gut. about some dietary triggers and FODMAPs. Listen to one of those podcasts that applies to you if you haven’t and look at the transcript. Other topics that we will be discussing here include fiber. There are two kinds of fiber: soluble fiber, which means that it easily dissolves in water and binds to water and; insoluble fiber, which does not absorb water or dissolve in it. Insoluble fiber are things like the bran layers of cereal grains or rice, like the fiber that is in whole-wheat bread or brown rice. Soluble fiber are things that are found in fruits and vegetables but also in oats and beans, lentils and barley so things like oranges, apples, carrots contained pectin and gums and mucilages that are of soluble fiber. Soluble fiber helps to fill the stomach and intestines with a gel that slows down contraction and helps to delay the absorption of sugars and breakdown products of carbohydrates so that blood sugars do not spike as high after we eat a meal. Then, further down, soluble fiber is a great food for our best, most helpful gut bacteria. Examples of soluble fiber that you can buy include the brand Benefiber available in any supermarket. A teaspoonful in water or up to a tablespoon in water once or twice a day is very helpful for people. That’s how it works. What about probiotics? Probiotics that are the bacterial type, which is what most of them are, are mostly made up of bifidobacter or lactobacillus species and these help our native gut bacteria by making enzymes to help digestion and also to help with immune regulation and vitamin synthesis. They also make chemicals that affect sleep or mood by interacting with the enteric nervous system, that second brain that we talked about a moment ago. Probiotics are also involved in both helping to finish digesting things that we could not digest in the first 3 feet of the small intestine, helping with immune regulation and vitamin synthesis and helping that enteric nervous system to give us the good feeling of having had a good meal and then later helping us sleep and helping our mood to be better. What are prebiotics? Prebiotics are organic chemicals that we cannot digest–our stomach acid does not break it down, but they are digested by the beneficial bacteria in the gut and increase their numbers. An example is an oligosaccharide that is the favorite food of our gut bacteria bifidobacter. An amazing thing about prebiotics is that it has been found that human breast milk contains some special human milk oligosaccharides that human babies cannot digest themselves. So human breast milk actually contains oligosaccharides that are there to feed the developing gut bacterial flora of that baby–In particular to help the bifidobacter species to increase in the newborn’s gut. So prebiotics are things that are food for the good bacteria. They make it through the stomach, they are not broken down by acid in the stomach, and they can affect the gut flora that way. An example of prebiotic is the Benefiber that I mentioned a moment ago. Also a product called Bimuno is a custom-made oligosaccharide product based on human milk oligosaccharides that people can buy. In the US, it is available on Amazon. Take that once a day as a little packet. There is a very good website www.bimuno.com that tells all about it. So how do herbs work? Herbs such as peppermint and ginger and for some people chamomile, fennel or caraway seed oil can actually interact with the gut enteric nervous system or directly with gut smooth muscle. How do they do that? It turns out that peppermint oil contains menthol which blocks calcium channels in gut smooth muscle and relaxes spasm, thereby letting normal contractions resume. Calcium channels are present in all of the muscle of our bodies but they are different in the smooth muscle of the gut compared to the muscles of our arms and legs. Peppermint oil relaxes the calcium channels in smooth muscle. Ginger interacts with serotonin and acetylcholine receptors in the gut and brain to reduce nausea but also to reduce bloating or pressure in the gut. I have often received very good feedback from patients about the benefits of different peppermint products and also different ginger products to help them with their IBS symptoms. These are the ways that they work–through calcium channels in muscle in the case of menthol in peppermint, and in the case of ginger with serotonin and acetylcholine receptors in the gut and brain. So how do medications work? There are several classes of prescription medications for irritable bowel syndrome. One category are the anticholinergics. These are medications with names such as dicyclomine or hyoscyamine. The way these work is by blocking acetylcholine neurotransmitter at the receptor level on gut smooth muscle. So they relax smooth muscle in a way that can be very effective, very helpful for some people with cramping and pain. Unfortunately, these anticholinergic medications dicyclomine and hyoscyamine can cause dry mouth, visual blurring sometimes even some dizziness or feeling sleepy or even slightly confused, especially if too much is taken. Mostly the dry mouth is the limiting side effect for a lot of people that can make it difficult to take these very much, but when pain is very bad they can be helpful. Tricyclic antidepressants: the tricyclics are an old group of medication that came out in the late 1950s and 60s. They were among the first antidepressants, and when they were given to people they turned out not to be the best antidepressants in the world but they were very good for some people with chronic stomach pain or urgent bowel movements or for people with a urinary bladder that seems always wants to empty. So it was found that the tricyclics were the first gut and bladder drugs. They were in a sense the first medicine to relax the gut and bladder. They work by interacting with norepinephrine and serotonin receptors in the gut, brain and urinary bladder. The tricyclics also have an anticholinergic effect and that means that they can cause dry mouth, constipation or excessive grogginess for some people. Another category of medications for irritable bowel syndrome are the SSRIs, the selective serotonin reuptake inhibitors such as Lexapro or Celexa which have the generic names escitalopram or citalopram. What these do is increase serotonin levels in the brain and indirectly can have an effect on how the gut functions because of the very strong links between the brain and the gut. Another thing that is used to treat IBS symptoms is simethicone. Simethicone is a chemical that reduces surface tension of water in the gut. It allows gas bubbles to dissolve back into the liquid in the GI tract. Brands of simethicone include Gas-X or Phazyme . Both Gas-X or Phazyme are sold in every supermarket or pharmacy and can sometimes be helpful to reduce a sensation of a stomach full of gas or bloating in the intestines. Another medicine used very often for IBS diarrhea symptoms is loperamide. Loperamide is a gut opioid agonist. Opioid receptors are the receptors that medicines like morphine and OxyContin and codeine interact within our bodies. There are opioid receptors in the got too and when they are stimulated, they slow the gut down. So loperamide is an over-the-counter gut opioid agonist that slows down the gut, reduces diarrhea or prevents it. The original brand was called Imodium and store brand antidiarrheal medicine is usually loperamide. Sometimes antidiarrhea medicine is the same thing that is in Pepto-Bismol in some stores. So you have to look at the label to check. But loperamide is a very powerful medicine to slow down diarrhea or prevent it and it is quite safe to take in the recommended amounts of not more than 16 mg per day. It is very rare to get bad side effects from loperamide. It does not last for very long–time you can take a dose and it will wear off in 6-8 hours. Another category of medication is diphenoxylate-atropine. This is a prescription medicine for controlling diarrhea. It is both an opioid agonist like loperamide plus it has an anticholinergic medication mixed in with it and it works like the other anticholinergic medicines I mentioned a moment ago. In some situations when people are having very bad intestinal pain and spasm a short course of treatment with a benzodiazepine such as clonazepam is something that a physician might consider. Sometimes when there is very bad anxiety that is expressing itself as very, very irritable guts and urgent diarrhea it can help to start off with a small dose of a benzodiazepine, and work into some of these other treatments later on. One of the best treatments for irritable bowel syndrome is working on the stress part of it. There is definitely, as I have gone over in my other podcasts, a strong gut-brain link, and besides working at this just with medications, you can work at it by learning techniques to use stress reduction as a way of controlling your IBS symptoms. One of the ways of doing this is referred to as mindfulness based stress reduction. An example of a very good book about mindfulness based stress reduction is called A Mindfulness Based Stress Reduction Workbook by the authors Bob StahL and Alicia Goldstein. They give credit to John Kabat-Zinn, who began developing this concept of mindfulness based stress reduction back in the 1990s. It works at the brain-gut axis level. When you slow down your breathing, and focus on the present moment, not worrying about being in a rush, just learning to relax, that goes right down the vagus nerve and other nerves to the gut. It can help to reduce symptoms but it takes some effort to learn. You can’t just listen to me on this short broadcast and know how to do that. It takes a coach, it takes some learning. Dr. Doug Drossman, the longtime director of the motility disorders unit at University of North Carolina Chapel Hill, gets much of the credit for doing the studies that show how learning stress reduction techniques could make a big impact on controlling symptoms of irritable bowel syndrome. Dr. Drossman is now in private practice. He is the emeritus director of the University of North Carolina Chapel Hill Center for Functional GI and Motility Disorders and I give him credit for bringing that to the attention of doctors like me and helping to develop more of an emphasis in helping patients to learn to control their IBS by learning techniques to reduce their anxiety, reduce their reactiveness to their IBS symptoms and stop making their symptoms worse by reacting in a negative or catastrophizing way. That’s the word catastrophe turned into the verb catastrophizing, that is, making things worse than they really are. So this is been a review of some of the ways that IBS can be treated and how they work. Refer to my other podcast segments that focus on different aspects of IBS symptoms and the best ways to try to get a handle on them and improve them. And watch for other podcast segments that will talk about other important areas for people with IBS or other functional GI condition to know. Thank you very much for listening on my website which is MartinCarrMD.com. You will see the links to the transcripts of these podcasts as well, and eventually more other interesting things too. Thank you all for listening and I wish you good health and a good year in 2018.